Wildfires rage in Southern California. Authorities find Casey Kasem in Washington state. And the national 9/11 memorial opens today in New York City. Hot times: What's going on in San Diego County? Nine wildfires sprang up yesterday, burning more than 9,000 acres. A long-running drought is part of the problem, but it's only May and temps are already near the century mark. Thousands have had to evacuate. The flames are burning near universities, military bases and a nuclear power plant. Death toll climbs: There appeared to be little hope of finding any more survivors after a mine fire this week in western Turkey. With the death toll approaching 300, the nation's Prime Minister said up to 120 more miners were still inside. Search crews filed out of the mine with stretcher after stretcher carrying corpses. Missing host: Radio icon Casey Kasem has been found in Washington state. We don't know exactly where, but Kitsap County sheriff's deputies found him and his wife yesterday at an address provided by California Adult Protective Services. Kasem's daughter was granted conservatorship of him this week amid a long-running battle between his children and his wife. The former radio host suffers from dementia and had been staying at a nursing home. Second chance: L.A. Clippers owner Donald Sterling wants to let bygones be bygones. In the second part of an interview with CNN's Anderson Cooper, he said that he hopes for forgiveness from his fellow NBA owners - and the people he has offended. The NBA banned Sterling for life from the league and fined him $2.5 million for racist comments he made in a recorded phone conversation. Ground zero: The National September 11 Memorial Museum in New York opens today, nearly 13 years after the terror attacks that rocked the United States. It will first open its doors for the 9/11 community - survivors, families, rescuers. It will open next Wednesday to the general public. It contains 12,500 objects, 1,995 oral histories and 580 hours of film and video. –Close call: A woman on a motorcycle narrowly avoids hitting a horse as she zooms down a rural road. - Snoring hedgehog: Here's one more thing you can check off your bucket list. - Metal substitute: This one is for you Slayer fans. Imagine your favorite band with all the guitar parts replaced with ukulele. Maybe we're witnessing the birth of a new genre. Or maybe not. - We're going to be family: Watch as the cat of the house meets the new baby for the first time. - River rescue team: A baby elephant nearly gets swept away by a raging river before mom and some other members of the herd come to the rescue. I watched the National September11 Memorial Museum dedication. Touching,moving and beautiful. I enjoy the New Day articles pertaining to animals. The snoring hedgehog and the cat meeting the new baby for the first time are both adorable. This is how I look foward to starting my New Day every morning with a smile. Thank you again. Thank YOU, Margaret! So happy you're with us each morning. 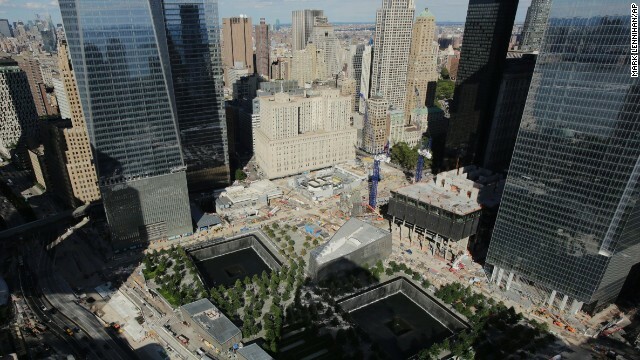 Be sure to stay with CNN today, as we cover the National September 11 Memorial Museum dedication at 10 am ET.